On the first week that EOS Mainnet was live EDNA began dropping 1 billion EDNA Tokens on EOS Genesis holders, with 300 million reserved as detailed below. Here you can find our where to get EDNA and how to safely store them. The future of the EDNA Token will be determined by the DAC. However, there is a proposal in place drafted by the founders. click here or scroll to view it. This airdrop also dropped tokens to holders who had less than 100 EOS who registered on the EDNA website prior to July 25th. No further airdrops or give-a-ways will occur, beyond the staking program. EDNA Tokens can be traded with and purchased using EOS at the exchanges listed below. What will the DAC Decide? EDNA is a blockchain-biotech DAC currently forming with the purpose of securing human ownership, privacy and monetization rights to human DNA. EDNA DAC empowers its members by making available to them a mechanism to privately and completely autonomously convert DNA material to digitally blockchain stored data, then though the use of private keys and other permissions grant access to interested researchers & biotech organizations for the purposes of advancing genetic science. Researcher Proposals are approved or denied by community though opt-in votes. 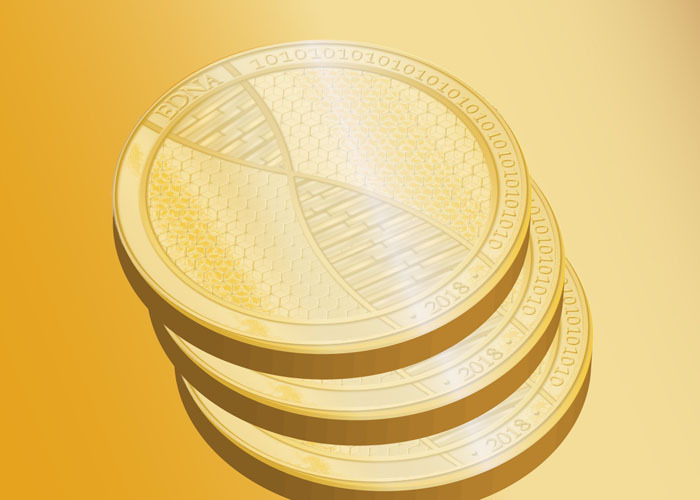 Proposals will include clear distribution of proceeds among EDNA token holders, plus multipliers for Token Holders who provide DNA to the proposed research and (if part of the negotiation) and residual ownership rights or proceeds offered to the community for monetized products and services which may result from the research activities. Staking EDNA tokens in the EDNA-DAC contract entitles token owners profits as explained above as well as to voting rights within the DAC. The DAC will determine day to day operating policy, and various other matters brought before the DAC. EDNA DAC is being formed by EDNA Sequencing, however the sequencing arm of EDNA is not the DAC, and in fact serves to provide DNA sequencing services at the will of the DAC. The DAC may chooses to cease to use EDNA Sequencing at anytime. It also may choose to offer options to its members by engaging other competing DNA sequencing services. The contract for voting internal to EDNA is in development, and is expected to be published around late November 2018. After the contract is in place, and voting can begin, once 300 million or more EDNA’s are staked to the DAC contract, voting shall be enabled, and this proposal shall be ratified as is or proposed in a modified and/or more complete version. Numbers above are used to calculate percentage of payout per individual accounts holding staked EDNA’s in the EDNA DAC system contract when data is sold. The percentages are also used to calculate any residual payments due the DAC per agreements with researchers.